We welcomed a lovely crew from Yahoo! Finance to our tiny house this week. Here’s the video and my thoughts on the experience. Thanks for watching/reading and enjoy! I enjoyed filming today. The sixteen year old me who wanted to be famous was jumping up and down. They were at my house to film my family. What I kept wondering was why? I asked Farnoosh what she thought about it. “Why are we interesting to the media?” She said “You are normal people. This is something people can relate to.” It’s funny last time we were outrageous, or at least what we are doing was outrageous. Now, we are being filmed because we are normal people living in a tiny house and the “general public” can relate to us. I guess because we’re “normal” (what is that anyway?) you might be able to relate to us and then be more inspired. Here’s the thing: we really do live this way, and it’s really awesome. It hasn’t been easy, but it’s fun. It gives us something to do, keeps us entertained, challenged and gives us the satisfaction of a job well done. “Living with less is so much more.” Farnoosh says on her video. It’s true. There is a richness to living simply that I wish everyone could feel. Scaling down is something we can all do, and believe it or not, our family can do more. From where you sit right now, look around. What are you doing with your consumer life? What can you scale down? I know living in a tiny house isn’t for everyone. I know it seems slightly impossible, but if you think about most things too long before doing them, everything can seem impossible. In order to accomplish anything large or tiny, we have to set a goal and keep moving toward it. We don’t seek perfection; we just set a goal and try, and then stay focused enough to follow-through. 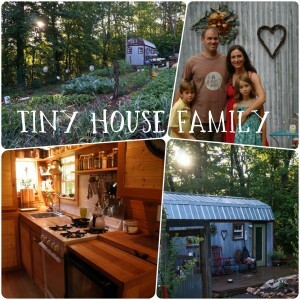 Our goals have been to grow a garden and build a tiny house. I am not the best gardener; I am just learning. I learn from my friends and community. I ask a lot of questions, and then I dig my fingers into the dirt and try. Now, my garden grows. I did not know how to do that perfectly, but I put seeds in the soil and watered them. Now, our tiny house is built and we’ve lived in it for a year. We did not know how to do that perfectly, but we bought a trailer and raised the first wall. Of course it isn’t enough to start, we have to follow-through, even when nothing seems to be happening. On the dry weeks, when no seeds are popping up, I water the dirt with faith that those seeds will sprout. When we were building the tiny house, and there was two feet of snow on the ground, Karl still drove to the property with a small propane heater to heat the inside while he taped up vapor barrier. We start, we keep moving (follow-through) and we have the vision of completion. Clearing away the clutter and focusing on one or two goals at a time has given us the clarity and focus to accomplish a lot. All of the unnecessary items we keep (both tangible and intangible) keep us from achieving our dreams. When there is less clutter, there is freedom to do what you really want in so many ways. By focusing on what really matters, getting rid of what doesn’t and stepping out of the consumer culture, we have stayed out of debt. We are free to make decisions that might not even be options if we carried consumer debt. For example, Karl and I both changed jobs recently, not for more money, but for more time and satisfaction. Now, there is time for me to write for the blog, tend to the garden, and play with the kids, and there is time for Karl to find salvaged materials, and great deals to build the first phase (16’ x 24’)of our small house. Scaling down comes with the freedom and clarity to figure out what really matters and then pursue it. I wish you all of freedom and clarity to live life your way! “Mission accomplished, everyone can go home now,” I said. And we laughed. But, we could have. Because, as we have been getting a bit of media attention lately, I have written and thought a lot about why we are doing this. Why should we allow these cameras into our home, and sacred woods? Why are we doing this? The simple answer is to inspire you to live life in your way. When Keith said we were inspirational, he made it all worthwhile. If we can inspire just one person, then this will all have been worth it. And we have! The rest is gravy. Next time you think you need to run out to the store to buy something, don’t. Wait a week. Look around. Is there something else you already have that can be used instead? Maybe your TV is fine, and you really don’t need a new one, or you could turn your extra fabric into a shower curtain. By delaying gratification, often the urge to buy leaves completely. Remember, if you buy it, you have it until you get rid of it. There’s a huge commitment to having stuff. You save a lot of energy buy not getting it in the first place. Always an inspiration… For as long as I’ve known you, you have touched my heart and spirit. Always been a model of what we are all capable of. You are living proof that money can’t buy happiness and it is evident in the laughter of your children at play. Things don’t make us happy, people do and I thank you for being part of my happiness. Awww, Pappy. I love you. You have been a great teacher to me. Our relationships are certainly what’s most important. I miss you and hope we can play soon. Plenty of room here–come on up! Oh my goodness! I have found you again, and you and your family are right here in Virginia. There is so much to catch up on, but I’ll start with this brief (hopefully) comment. (I’ll try and email you soon.) I have been reading everything on your blog to catch up, and waiting for a new post so I could comment. Anyhow…what just tickles me is how we have had different journeys (lots of backstory here too) but have arrived at many similar conclusions. You touched on much in this post: living without debt gives us so much freedom; excessive “stuff” just weighs us down. I could go on and on myself…. We are still far from being where we want to be, but we are making progress. I’ve been looking for you since we moved to Virginia! So glad you’re here. I’ll email. . .
Hari, congrats on your beautiful family. Myself, my husband, our 4 kids and a dog lived in a tiny motorhome for a year. It isn’t easy, but we were much closer to each other and God. We are also debt free, and intend to stay that way. God Bless! Your story is very inspirational to me. I think living with less is definitely the way to go. We currently live in a 1,500 sq foot home and are doing fine. I can definitely see the rewards of living with less stuff. We were thinking of adding on to our home or moving to a larger home but now I think if we declutter and lose some of the stuff we don’t really love or use anymore this home will be plenty big enough for all of us. Yay, Maggie! Yes, it will. Good for you. Best!! Hi, I just read about you on yahoo.com and love your website. 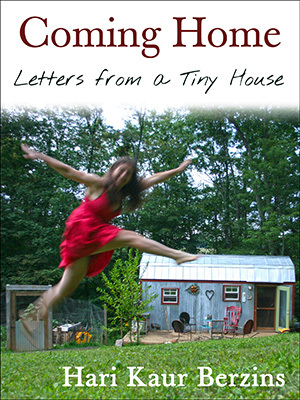 I am gradually trying to downsize, and find your lives inspirational. Please keep us posted as you move along! Hi, Hung! Best of luck on your downsize. I am glad you find inspiration here. I will keep you posted! Best!